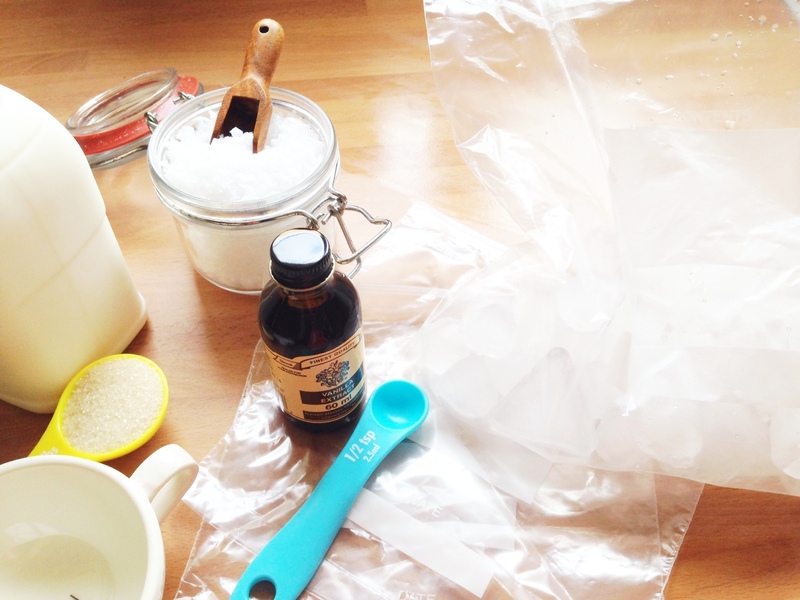 Get your jiggling arms ready–we are going to make ice cream in a bag! I know we say this a lot on Mini Yummers, but this really is easy peasy lemon squeezy (without the need to squeeze lemons). You can make delicious ice cream using only a handful of ingredients that you probably already have. And it takes no more than 10 minutes to make… promise! 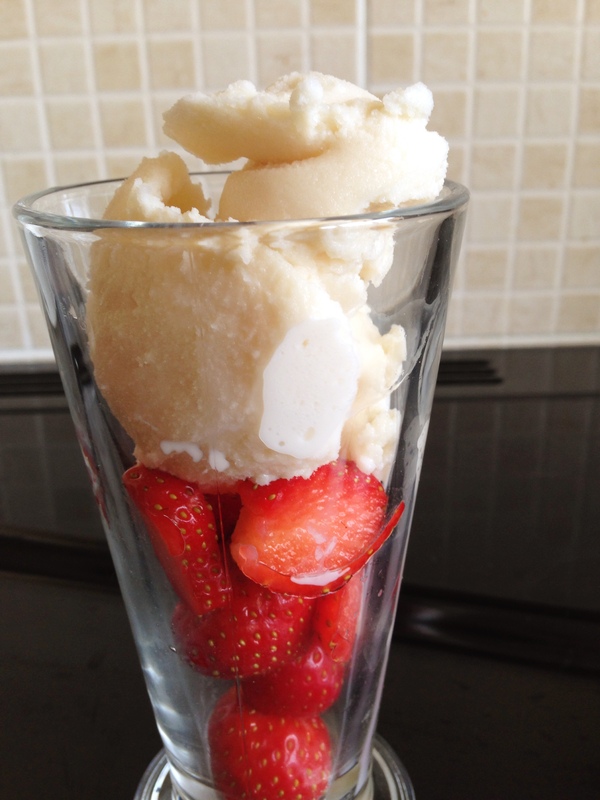 * If you use milk then your ice cream will be lower in calories. If you use cream then your ice cream will be creamier. 1. 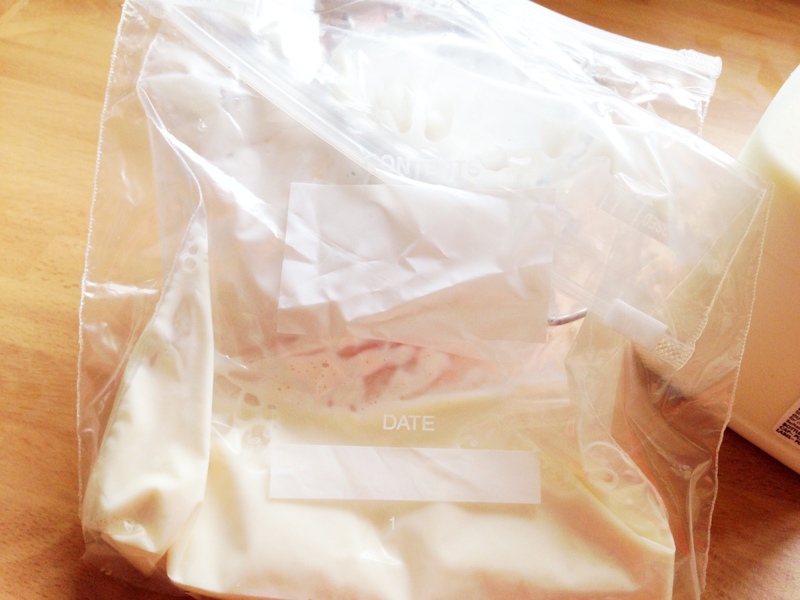 Measure your milk/cream, sugar, and vanilla into one of your small bags. Seal it up, getting rid of as much air as you can. Place it inside the other small bag and seal that up too. 2. 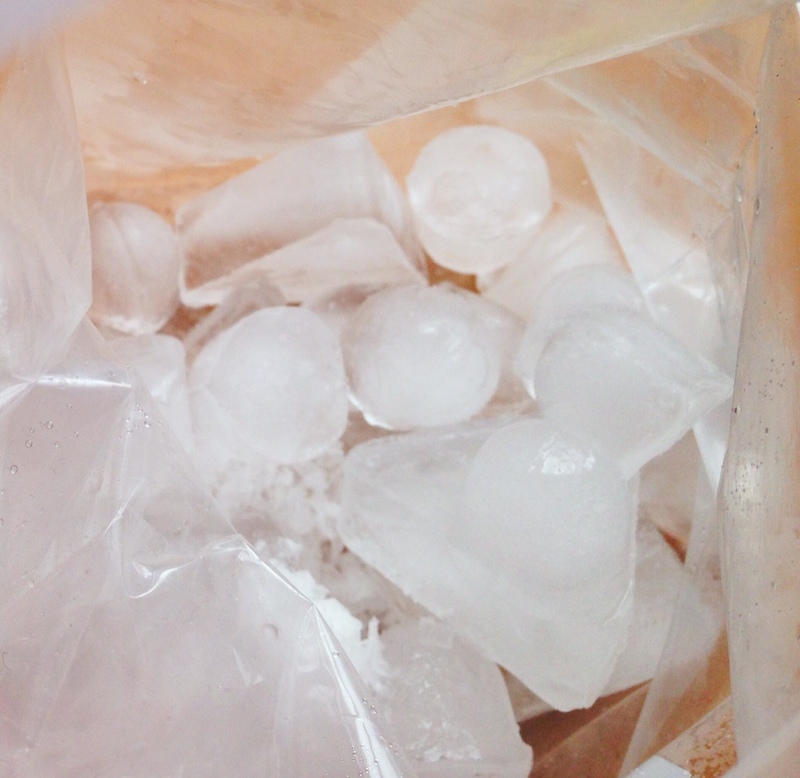 Tip your ice into the large bag, followed by the salt. Give a little shake to get the salt mixed in with the ice. 3. 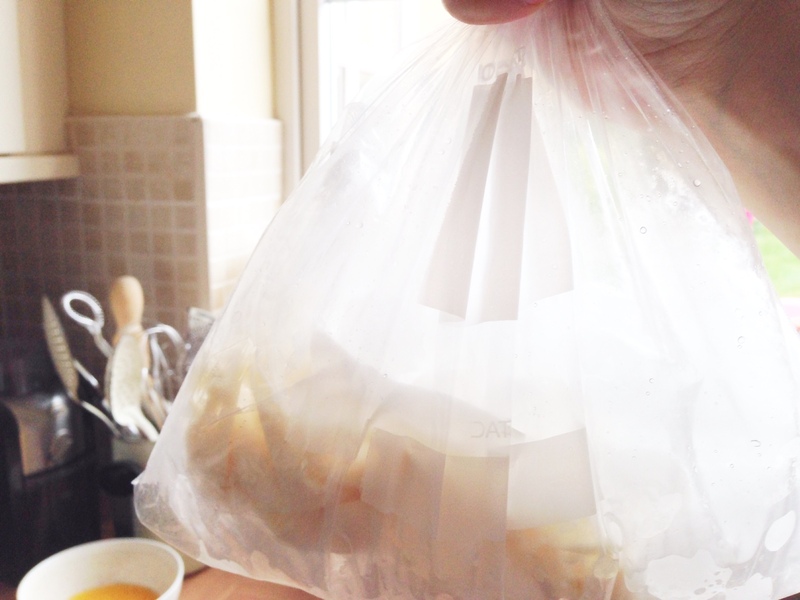 Put your small bag inside the large bag, and make sure it’s buried in the ice before you seal up the large bag. 4. Shake, shake, shake for around 5 minutes. You can use a tea towel to protect your hands from the cold. 5. Give the small bag a poke to see if it seems ready. If not, make sure it’s buried in the icy mix again, and shake for up to 3 more minutes. 6. Take out your small bag and wipe it down, so no salt gets into your mix. Open it up, and ta-dah! 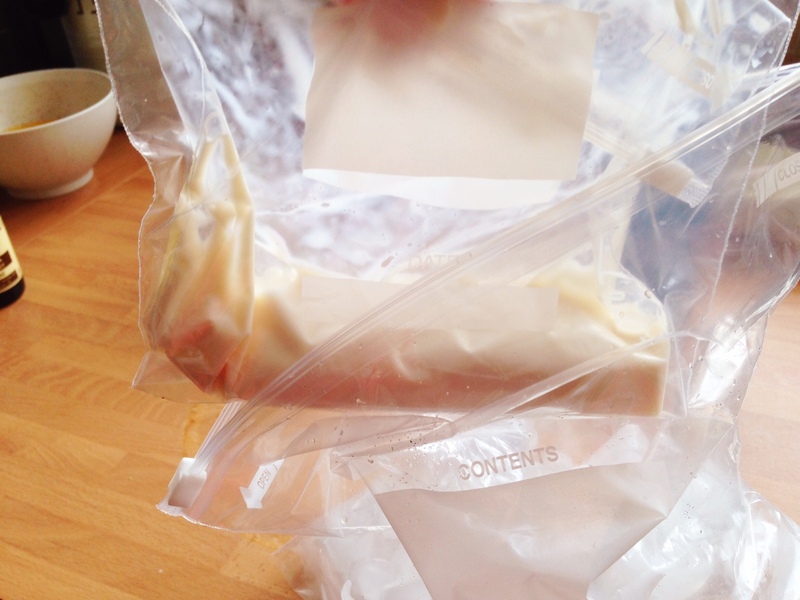 You’ve made ice cream in a bag. How do you think you could make your ice cream even more yummers? Try adding chocolate or caramel sauce to your milk at the beginning. Use milkshake instead of plain milk. Add some small fruit pieces or fruit syrup. Why Do We Need Salt to Make Ice Cream? Salt is used to lower the freezing temperature of water. Your milky mix, even when packed with all that ice around it, just won’t freeze at 0 degrees centigrade. Water will freeze at this temperature, but milk won’t. So we need something to help us… salt. When we mix in our salt with the ice, it makes an icy/salty mix that brings the temperature down to something like -18 degrees centigrade. This is cold enough to freeze your milky mixture. Ice is probably the coldest thing we can think of, and ice is solid. But, even though our mix of salt and ice becomes a liquid, this does not mean that it has got warmer. It is not solid like ice it, but it is colder. 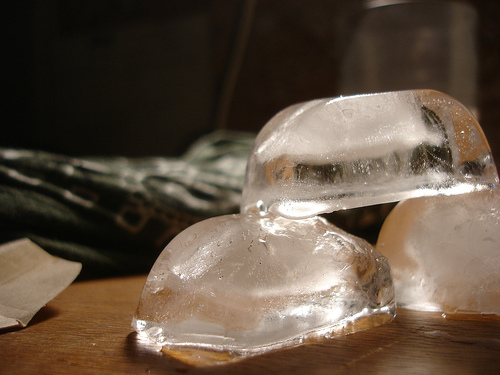 Image credit: With thanks to Kevin Saff for the close-up ice cubes image.